This is from a fun family cosplay shoot I did with cosplayer/actress Lauren Clover and her boyfriend actor/writer Tim Biasi. 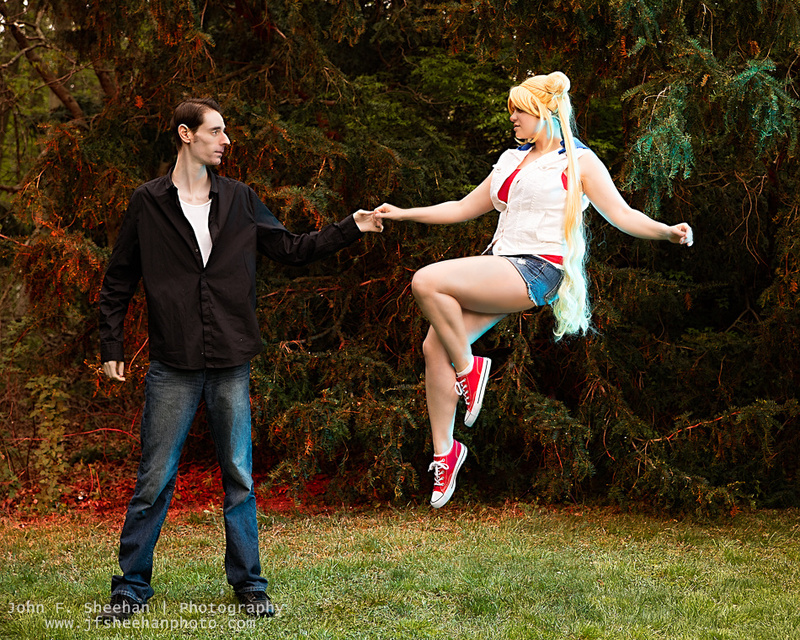 Lauren wanted to do a street version of Sailor Moon and Tuxedo Mask from the anime. The background was sort of yucky, so I had two strobes, one with a red gel and one with a blue gel, pointed to the back and slightly feathering them. The main light was my Alien Bees 800 in a soft box to my right. To achieve the floating effect, I had Lauren pose on a ladder with my Canon 5Ds-r locked down on a tripod. After I got the shot I had them walk out and the ladder was removed by an assistant. Then I took a clean shot without them. In Photoshop I brought the two photos in and erased the ladder.